This update is all about privacy and improving the experience for the participant. Please read the following changes carefully! The update of the web portal will happen on Monday on 04.06.2016 at 22:00 o'clock (UTC+1, Berlin time zone). There will be a planned downtime of about 30 minutes. The update of the movisensXS app (Version 1.0) will happen in approximately two weeks. The beta version will roll out tomorrow. As always, if you are running a productive study, if possible, please disable auto-updates for the movisensXS App because the new user interface of movisensXS may confuse your participants. This is especially important on Android 5+ smartphones with activated "Lock Other Apps" functionality, because running studies are stopped when the update is installed automatically and a new permission has to be granted to continue the study. This version is the last version supporting smartphones with an Android version below 4.0. If you use a older smartphone please check if an Android update is available. An informed consent that you can define for your study in the study settings (optional). An informed consent from movisens, that gives us the approval to process the data of the participant. We also allow participants to opt-out of our app crash reporting provider Crashlytics. A screen that lists all the required permissions in your study. This gives the participant transparency about the data that is acquired during your study. On Android 6 and above the participant has to grant some of these permissions manually and we guide the participants through the process of granting them so your study can run smoothly. This behavior only applies to studies that are not yet coupled to smartphones. Already coupled studies or studies with an older app do not show these screens, except for Android 6 Smartphones. 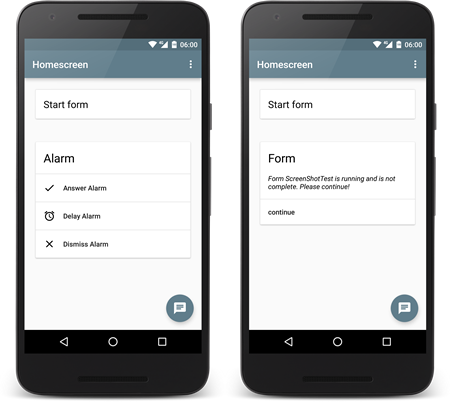 From the home screen a participant can directly take an alarm or continue a form. These are shown as cards on the home screen. More and more private smartphones of participants are used. This is why we removed the "Smartphones" tab in the web portal. We no longer store any device specific ids. Please backup your device IDs if you need to know which participant used which Smartphone. The results table changed: The "Device" column is removed and the columns "Trigger_date" and "Trigger_time" are added. This allows checking when an alarm was issued and when a participant started to complete a form. Phone numbers are now hashed by movisensXS generated identifier (hashes stay the same per participant). Retry upload of results automatically if no internet connection was available. Yeah, what a release. As always, let us know if you have any questions. Please spread the word and tell your colleagues about our great new features.